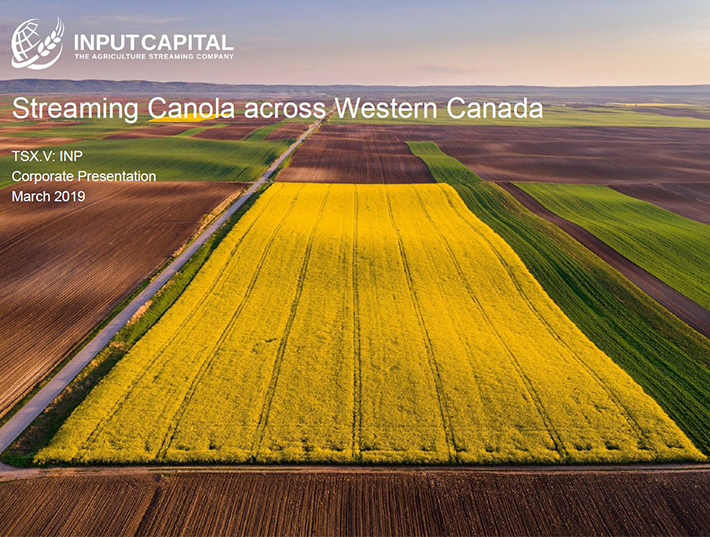 REGINA, Oct. 3, 2018 /CNW/ - Input Capital Corp. ("Input" or the "Company") (TSX Venture: INP) (US: INPCF) is pleased to announce that it has completed its second credit agreement for mortgage stream financing. This one is with HSBC Bank Canada ("the "Bank"). The HSBC credit facility (the "Facility") has been created via an amendment to Input's existing revolving credit facility with the Bank, and provides for up to $10 million in a revolving debt facility secured against the mortgages underlying the mortgage streams Input has with its clients. The Facility finances up to 100% of the original mortgage principal at bank prime + 1.0% or using Banker's Acceptance to lock in interest rates for up to 365 days at a time. By allowing Input to margin its mortgage streams, this Facility reduces Input's capital required to originate mortgage streams, significantly improving returns on equity while enhancing Input's ability to build a larger book of mortgage, capital and marketing streams. Due to its revolving nature, this Facility can be used again and again as an internal mortgage warehouse facility to build mortgage inventory for sale or refinancing. Doug Emsley, President & CEO of Input, said: "This facility expands our ability to fund mortgages and furthers the establishment of a template for the kinds of mortgage financing facilities we seek to complete with our existing banks and/or other financial institutions. We will continue to grow the amount of capital available to fund our mortgage stream business by expanding and/or replicating our two mortgages facilities many times over."